I always find it difficult to give an account of myself, and also words often fail me —when asked to talk about myself. Perhaps this the reason why I write— to see my own reflection in my creations. Still, I see myself as a person who writes, writes out of curiosity, writes out of hunger, writes out of love and for whom poetry is the best medium of writing when it comes to expressing those thoughts which cannot be depicted through direct and exact sentences. How did you get interested in writing and how your family, teachers and friends supported you in your effort? Writing for me has been extremely personal. I used to write for myself, and still I write for myself but somehow, an audience for my poetry has come up, which is why I have found an interest in publishing my poems. People around me have been both supportive and discouraging at times. But, these didn’t matter much because of my personal connection to writing. I was never much influenced by poetry, but somehow I found it as the only respite from the social dilemmas and confrontations, persisting within my own conscience at any given time. At times, I felt writing poetry is the only thing I can do. This was the reason why sometimes willingly and sometimes unwillingly I kept writing, and slowly & slowly it became an intrinsic part of my life. What are your thoughts on situation of literature in our country, as compared to other nations? Literature in our country is booming. If we consider the upsurge in literary festivals and literary magazines, India can be counted among the top countries when it comes to contemporary creative writing. The book market is huge and almost all big players in the publishing industry is investing in India. Do you think there should be a separation between arts and the state or its the government’s business to regulate it? Politics and government have become synonymous nowadays. Extremism is the new spearhead of politics. No matter who is in power, the will to impose comes down heavily upon those who wishe to dissent. Art is all about free thinking and expressing them in distinctive styles and if it comes under the umbrella of a government, it is bound to have adverse affects. I think Art cannot be different from its state. Art in a particular country is bound to bear the flavour of the soil from which it originates. But, government interference should be kept to a minimum when it comes to art. Do you think returning awards is a justifiable way of dissent? No it isn’t and it cannot be. Should we have an asylum program for artists and writers who are persecuted in their countries for their views? It could be a wonderful idea. I believe writers to be fearless entities, and they have been sources of thoughts— which have served as the base fire of many national and international debates. Repression is worse than death and writing is an effective medium to stand against it. This is what writers are expected to do and this is what writers expect to bring about through their writings. Metropolitan cities like Kolkata, New Delhi and Mumbai are the hubs of arts. How can we bring other urban and rural areas in this dynamics? There are already many literary festivals in India doing a wonderful job in connecting other cities to the main hubs of arts. The intra-country cultural exchange is being effectively done by festivals such as Gateway Lit Fest, Hyderabad Lit Fest, Kumaon Lit fest and Pune International Literature Festival among others. As a writer, as an artist what are some of the challenges that you have faced in your work? The only challenge I face while writing is— I am never satisfied with what I write. Needless to say that this challenge has been one of the driving forces behind my sustained interest to write and read more. We mostly hear words like bestselling rather than literary masterpiece or classics that’d stand the test of time, why is it so? This era is addicted towards fast popularity. May be this is the reason but what rises fast without substance is bound get washed off from the walls of history. Writing should be something that can persist with a timeless quality; something that can be read over and over again for centuries. It is better to live a lifetime with quality rather than turning into a decorative torn page with none to search for it. What are your ideas to promote talented Indians working in the field of art and literature at both national and international level? 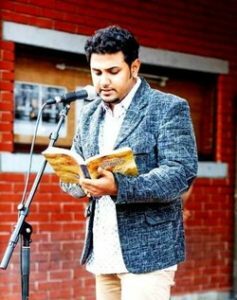 I have been associated with The Enchanting Verses Literary Review since its inception and have been able to provide a space to a number of young Indian poets alongside established names. I wish to start a poetry press soon, arrange poetry workshops and organise readings under the banner of the same. They are all in process and I hope they would be soon available for poetry enthusiasts in the country. Read, read freely without presumptions, read to relish, read to learn and enjoy the indeterminate and unresolved while reading. It is because of you that writers exist, and the flame of literature takes the pain to remain ablaze— just for of you.